Undergraduates from nine colleges and universities got to hear advice from Massachusetts Life Sciences Center (MLSC) president Travis McCready and a panel of innovators and entrepreneurs on how to prepare for careers in academia and industry during the Next-in-Bio event held earlier this month in the Foisie Innovation Studio. The event was designed to help undergraduates identify career paths and obtain critical skills, knowledge, and resources they will need. Students showcased their research projects and met with WPI's partners in the biotech industry across the state. Travis McCready​ addresses attendees at the Next-in-Bio event. This grassroots effort started three years ago, spearheaded by Reeta Rao, associate professor in the Department of Biology and Biotechnology, and Michael McGrade, dean of graduate admissions. The goal is to keep undergraduate students engaged and interested in the life sciences as well as bring visibility to the growing WPI life sciences graduate program. This year Jean King, dean of arts and sciences and professor in the Department of Biology and Biotechnology, said she is eager to expand the event, noting the importance of giving students from participating colleges across the commonwealth a chance to meet faculty and industry leaders, and explore the breadth of paths to take in the life sciences. King says that life sciences has a solid infrastructure in Massachusetts, and that WPI is a leader in the field. 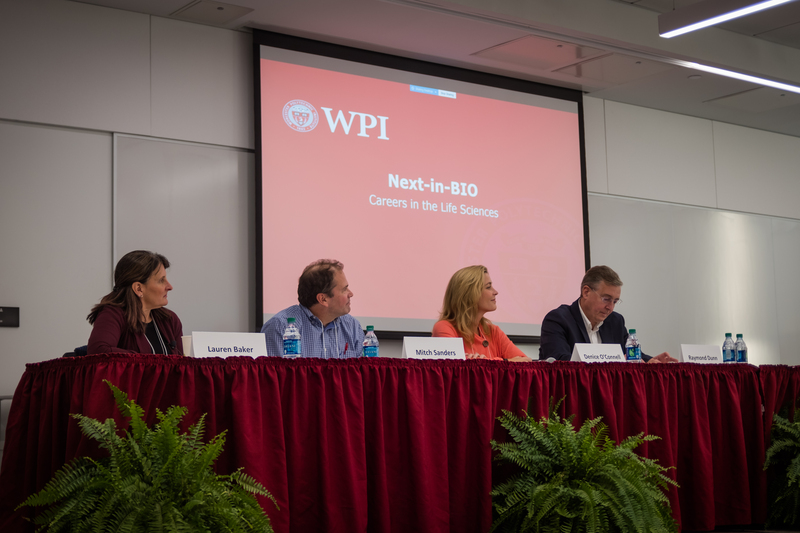 “WPI has a great potential work force, a great teaching approach that includes theory and practice, and is located in Massachusetts, a state that invests in and supports the future of life sciences,” she told the audience of about 70. WPI has supported the conference through the years and has made attendance free to students from the participating institutions. King says that data management is “the biggest revolution in health—ever,” and is happening right now. Treatments can be tailored to specific individuals, and can be based on their past history and present condition. Those thoughts were echoed by conference keynote speaker McCready, who aims to advance the life sciences ecosystem of Massachusetts. MLSC, a public/private economic development and investment agency dedicated to supporting the growth and development of the life sciences in the state, has directed $2.5 million in grants and investments to WPI’s Biomanufacturing Education Training Center. The Center has on-site bioreactors, controls, and other equipment designed for hands-on education to make the student transition to the working world seamless. In 2010 MLSC awarded a $6.6 million grant to WPI to support life sciences related development at Gateway Park. McCready applauded WPI for providing what he calls a “practical PhD,” incorporating workforce training with a robust educational environment. His talk focused on opportunities presented by the growing need for data, and data analytics and management. The meteoric increase in all things digital will provide opportunities for people with direct information skills. As he put it, “Big Data Matters. MLSC also has an interest in getting companies with pre-seed capital ready for a first round of venture funding. It seeks to provide children in K through 12 with access to resources and exposure to workforce development that they might not otherwise have. The company also places high school students in corporate internships, where they learn essential job skills. Rao said that the unofficial motto of the program is “from Kendall Square to Lincoln Square,” a quote she adapted from President Laurie Leshin that underscores the growing footprint of the biotech sector from Cambridge/Boston to the local ecosystem in the western suburbs and Worcester. Events such as Next-in-Bio serve as a workforce development and talent retention effort in the Greater Boston area. 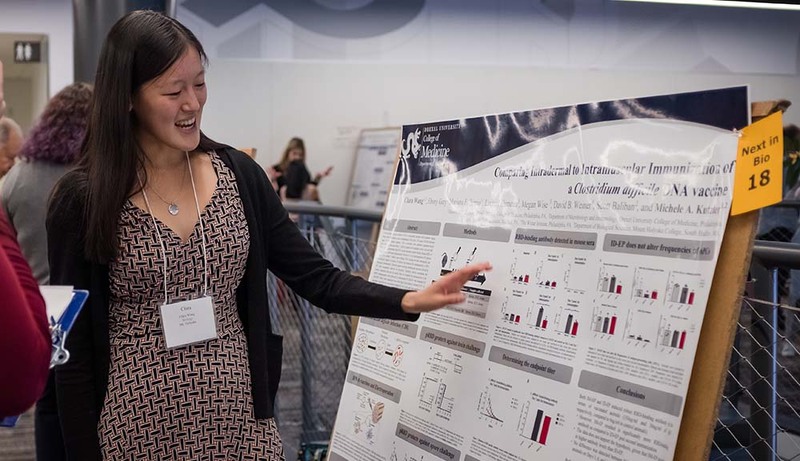 This program gives students a chance to explore career paths and display their research, and local colleges to recruit them for their graduate programs. In the long run, the hope is that our industry partners could recruit local talent here, she says. A panel of innovators and entrepreneurs, including Lauren Baker, president of Boston Biomedical Associates; Denice O'Connell, DVM director of biosciences at AbbVie Bioresearch Center; Mitch Sanders, chief scientific officer at Alira Health; and Raymond Dunn, MD, chief of the Division of Plastic Surgery, University of Massachusetts Medical School, spoke about their individual paths to become leaders in their life sciences fields. (L-R) Lauren Baker, Mitch Sanders, Denice O’Connell, and Raymond Dunn. Wole Soboyejo addresses the crowd at the Next-in-Bio Conference. Jean King (left) checks out one of the poster presentations at the Next-in-Bio Conference. The Next-in-Bio Conference gave undergraduate students the chance to prepare for careers in academia and industry.